Alright, we’ll get this rolling so you can get back to your lawn chair and refreshing beverage. Light up the grill and head inside for a few minutes to make the sauce. Raid the fridge for fresh herbs. I’m using tons of parsley and a few sprigs of tarragon. Toss the herbage in your food processor along with a couple of garlic cloves, shallot, walnuts, capers, and anchovies. Pulse it into a thick paste then loosen it up with a few glugs of olive oil and season with lemon, vinegar, and red pepper flakes. Done! Head back outside with sauce and steak in hand. I picked a NY strip because it’s my favorite to grill. Season the steak with salt and plenty of coarse black pepper and throw it on the barbecue. Grill it until it’s done the way you like, then let it rest under foil for a few minutes while you dress a bowl of arugula. Plate the greens. 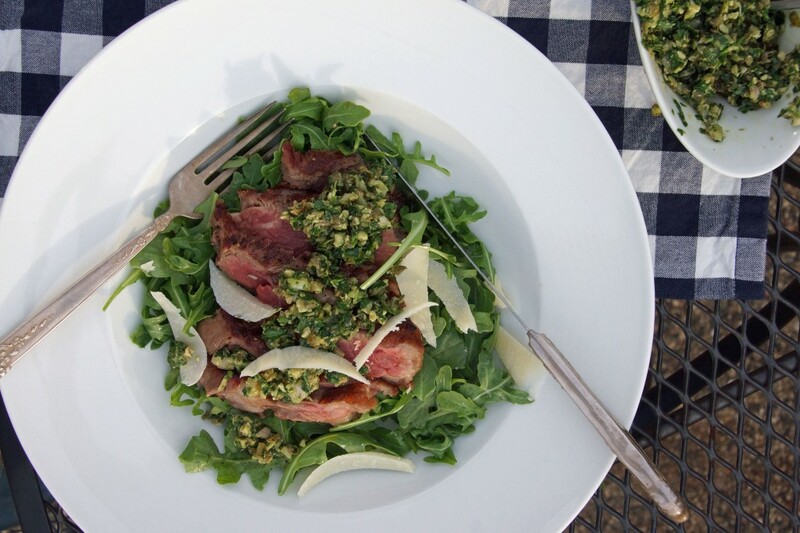 Arrange the steak over the salad, liberally spoon salsa verde over the top, and add a few shavings of Parmesan. Pop a bottle of wine, enjoy, relax, and work on devising a scheme to make these kinds of days come around more often. Salsa verde can be made with a variety of herbs. I love this version with parsley and tarragon. If you have extra salsa verde it is excellent smeared on grilled pizza crust or tossed with pasta. Light the grill. I use a charcoal Weber. Place all of the salsa verde ingredients except the vinegar and olive oil in the bowl of a food processor. Pulse until a thick paste forms. Stir in the vinegar to taste and stir in the olive oil to make it a more fluid sauce. Season, as needed, with salt and black pepper. 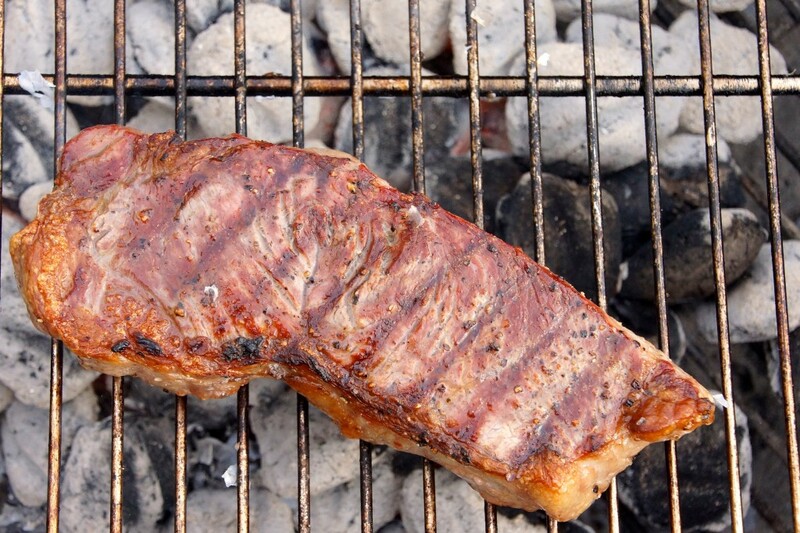 Season the steak with salt and pepper and grill over hot coals, 4-5 minutes per side for a medium-rare steak. Remove steak from grill, place on cutting board, and tent for 5 minutes while you dress the salad. Just barely dress the arugula with olive oil, lemon, and a touch of salt and pepper. Divide between plates. 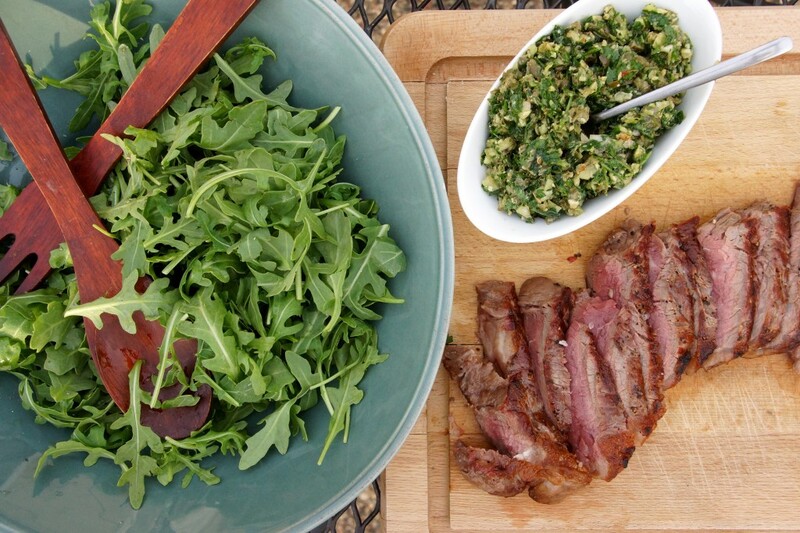 Slice the steak against the grain and fan it out over the salad. 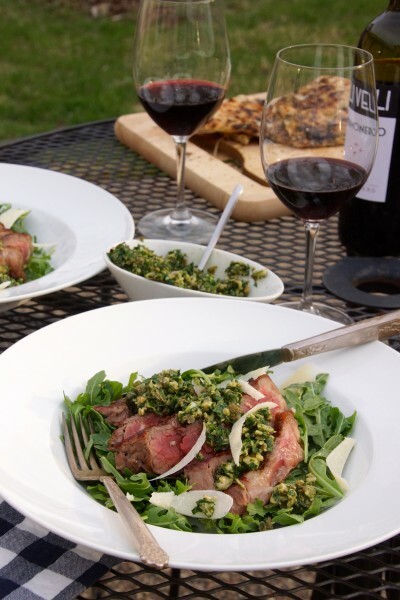 Spoon the salsa verde over the top of the steaks and use a vegetable peeler to shave parmesan over the plate. This recipe yields enough sauce for 4 portions of steak. I grilled 1 largish NY strip (about 12 oz) for Matt and I to share, which was just enough to be indulgent without feeling totally gluttonous. Made it last night – loved it! I made this (with a few minor substitutions, since I did it from memory 🙂 for friends over the weekend with flat iron steak and grilled pizza dough alongside. Beyond delicious.